Where is The Village of Baytowne Wharf located? What is the Village of Baytowne Wharf? Is there a cost to enter The Village of Baytowne Wharf? Can I fish in the lagoon? Is the Village of Baytowne Wharf closed to the public during events? The Village of Baytowne Wharf is located on the Choctawhatchee Bay in Sandestin Golf and Beach Resort. The Village of Baytowne Wharf is affectionately known as the "heart and soul" of Sandestin Golf and Beach Resort. With more than 12 restaurants, 15 retail stores and several nightlife venues, it has become the gathering place for everyone visiting, living or working along the Emerald Coast. We have a public parking garage and several auxiliary lots, which we offer a shuttle for our guests to the Village during summer time and for special events. Parking is free to the public. Valet is also offered on a first come first serve basis at the Baytowne entrance for $6. * For special events, including 4th of July and New Yearâ€™s Eve, there will be a parking fee. Check event information for more details. Visiting the Village of Baytowne Wharf is FREE and open to the public. The Baytowne Wharf Neighborhood Association, located close to another broken egg in the surface parking lot, has wheelchairs for guests to use on a first come first serve basis. A picture ID or credit card is held as collateral until the wheelchair is returned. The Village of Baytowne Wharf is a pet-friendly venue. All canines must be on a leash. Owners are required to clean up behind their pets. Waste stations are located throughout the Village. Guests are welcome to fish in the lagoon. Bait can be purchased at the Baytowne Marina. Please note the Village Lagoon is catch and release only. The Village of Baytowne Wharf is always open to the public, even during events, unless otherwise stated. 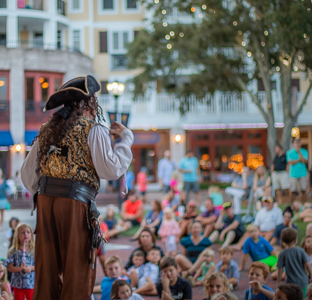 The Village of Baytowne Wharf hosts a Wednesday Night Concert Series from March to October every year, and special holiday concerts for the month of December. This series features some the best bands in the Southeast. See the Events Calendar for weekly lineup. It is suggested you bring a blanket or lawn chair. Coolers are prohibited.